Bahco S400 1/2 in square drive socket set with dynamic drive profile. DIN 3120/ ISO1174. Finish: matt chrome-plated Material: chrome vanadium. 1 each 1/2 in 6-pt dynamic drive sockets - 10, 11, 12, 13, 14, 15, 16, 17, 18, 19, 20, 21, 22, 23, 24, 25, 26, 27, 28, 30 and 32mm. 1 each 1/2 in extension bars 5 in and 10 in. 1 x 1/2 in universal joint. 1 x 1/2 in T-adaptor. 1 x 1/2 in flexible handle 10in with grip. 1 x 1/2 in ratchet handle 54 teeth. 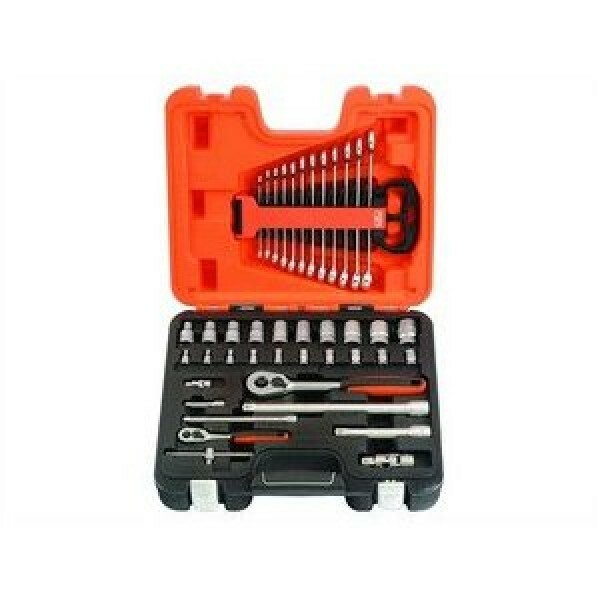 1 each combination spanners 7, 8, 9, 10, 11, 12, 13, 14, 15, 16, 17, 18, 19mm.